A stranger enters a magician's shop. Inside, among several strange customers, he sees an old man, who makes him sick with horror. The rest of the novel chronicles his quest for the elusive and horrible old man. My first Meyrink and it still reverberates. 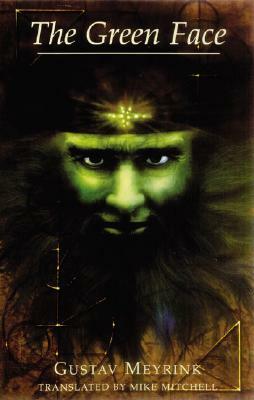 A man is haunted by a green-faced apparition (Khidr? The messenger of revelation in ancient Judaic/Islamic lore). His obsession chases him into the spiral of his own death? destiny? self-revelation? A lot is left to interpret, but it's a thick, phantasmic and suspenseful journey. An apocalyptic, cabbalistic novel set in a decadent Amsterdam. At the center of this book is the legend of the Wandering Jew, who here is also the prophet Elijah and the Green Face of the title. Well written and effectively strange in tone, the novel is marred by the unfortunate ethnic stereotypes of the milieu in which it was written, (Austria, 1916). A very interesting journey to the heart of the world of one of the best fantastic story writers in all times. Very easily red, the book captivates from the first few pages. A must read for Meyrink fans. Опять его герои сталкиваются с гремящим "знаю твои дела; ты ни холоден, ни горяч; о, если бы ты был холоден, или горяч! Но, как ты тепл, а не горяч и не холоден, то извергну тебя из уст Моих", и опять раз за разом предпочитают становиться холодными. И это, конечно, печально. Beautifully written but not my cup of coffee. Es un libro espectacular, sin lugar a dudas. Tiene muchos niveles de interpretación.Me encantó.Muy recomendado a todos los de la vía interna. Whilst not as good as "The Golem", still a damned good read. Another re-read. I never get tired of Meyrinck. I've actually re-read all of his books that I own over the last couple of months. A bit archaic in style, not one of is better ones IMO.